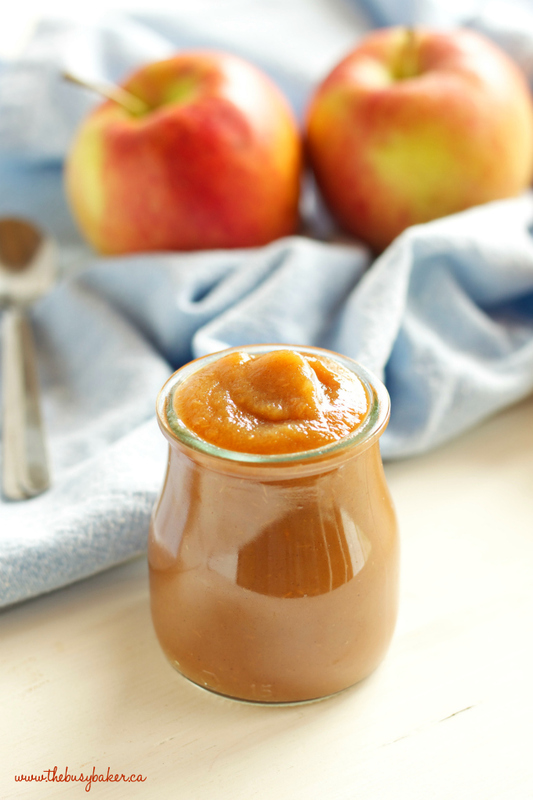 This Healthy 2 Ingredient Slow Cooker Apple Butter is the easiest fall apple recipe you’ll ever make! It’s made with only apples and a pinch of cinnamon, so it’s a super healthy recipe that’s perfect as a dip for fruit and low-fat crackers, or as a spread on toast, or even eaten with a spoon! Watch the VIDEO below to see how I make it, and don’t forget to stay tuned to the end of this blog post for the FULL PRINTABLE RECIPE! Looking for more apple recipes? 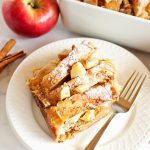 Try these Easy Healthy Apple Chips or this lightened-up Apple Cinnamon French Toast Bake! 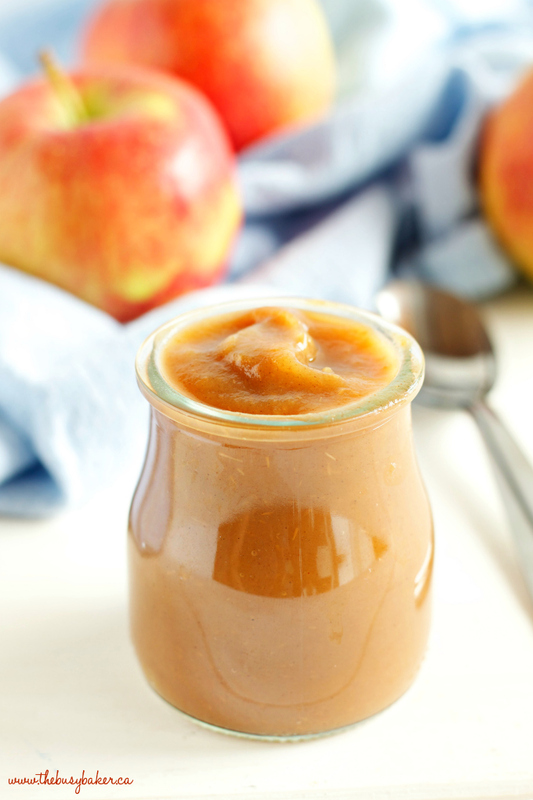 *I originally shared this Healthy 2 Ingredient Slow Cooker Apple Butter recipe in September 2015. I’m updating the post for my lovely readers today with new photos and a tutorial video! I don’t know about you, but where I live apples are delicious and plentiful in the late-summer and early-fall. As I child I picked apples with my grandparents from their trees and I watched my mom and grandma make apple jelly, apple juice and applesauce, along with all kinds of apple baked goods like pies, cakes and cobblers. 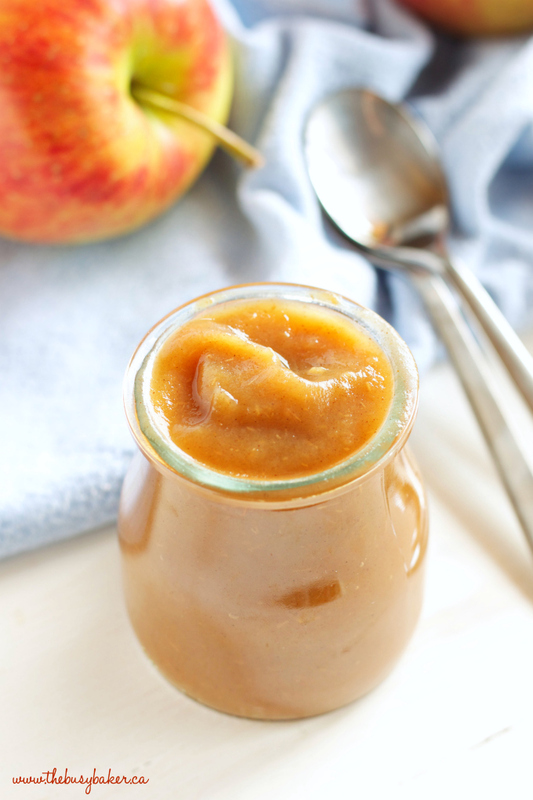 Over the years I’ve made my own applesauce and experimented with lots of ways to use up our fall apples, but it wasn’t until I discovered this Healthy 2 Ingredients Slow Cooker Apple Butter recipe that I knew my apple-efforts would be redirected. Apple butter is so delicious and it’s been the perfect addition to our family’s menu: it’s sweet and delicious but contains no added sugar, and it’s beautifully thick and spreadable so it’s a great alternative to fruit jams that can be high in sugar or other sweeteners. My kids love it on toast in the morning, and it’s also great on yogurt, ice cream, or even as a condiment to savory dishes at dinner time like grilled or roasted pork. 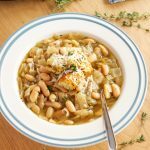 And the best part: it’s embarrassingly easy to make in the crock-pot or slow cooker! The original recipe I followed is by Oh She Glows and you can find the original recipe here. This is my take on it. 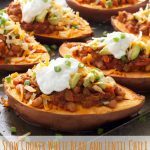 I absolutely love this recipe and I think you’re going to love it too! Doesn’t it look so spreadable and delicious?? 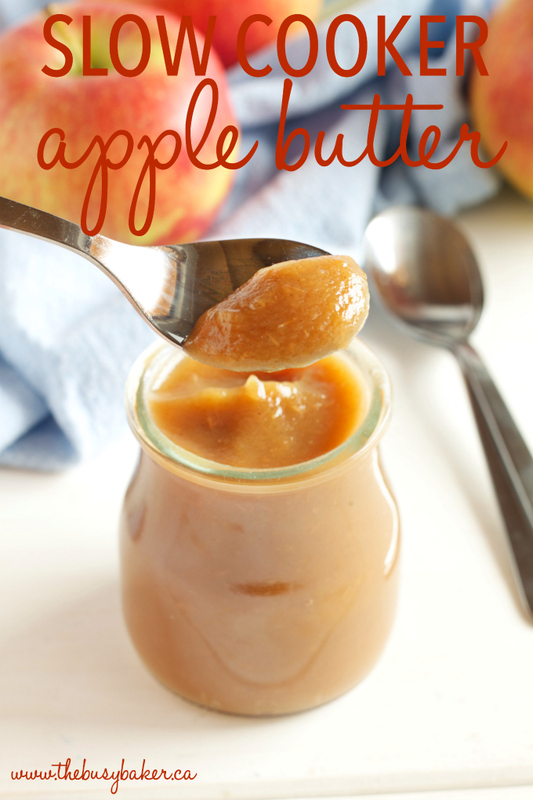 I hope you enjoyed this recipe for Healthy 2 Ingredients Slow Cooker Apple Butter. Let me know in the comments below, what’s your favorite thing to make with apples in the fall? 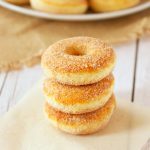 Looking for more delicious fall recipes?? Try these favorites below!! 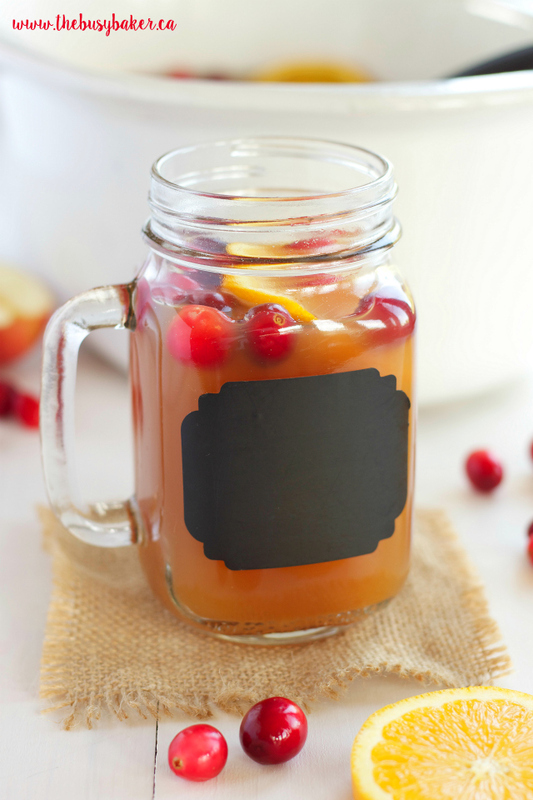 Try this Slow Cooker Cranberry Apple Cider for a super easy-to-make warm winter drink! 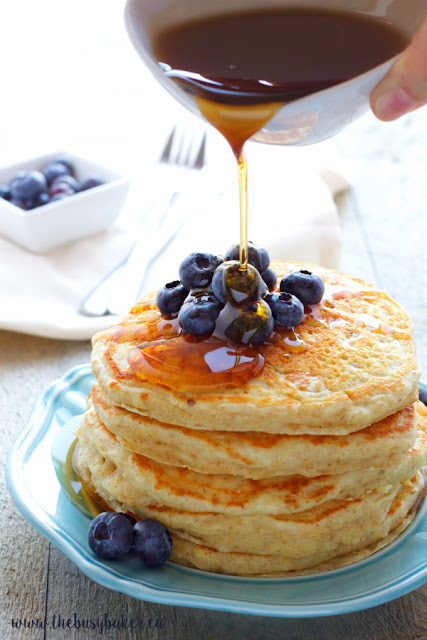 You won’t believe how delicious and healthy these Healthy Buttermilk Pancakes are! The secret ingredient makes all the difference! 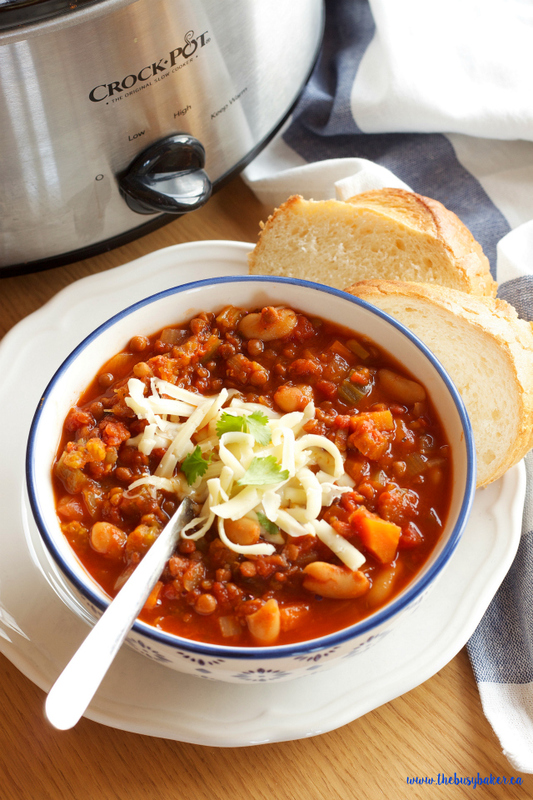 This Crock Pot Vegetarian Chili is my favourite crock pot chili recipe of all time! 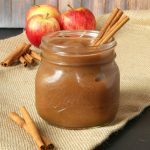 This Healthy 2 Ingredient Crock Pot Apple Butter is the easiest fall apple recipe you'll ever make! It's made with only apples and a pinch of cinnamon, so it's a super healthy recipe that's perfect as a dip for fruit and low-fat crackers, or as a spread on toast, or even eaten with a spoon! Start by washing your apples in a sink full of cold water. You'll be leaving the peels on, so make sure each apple is nice and clean. Dry the apples on some kitchen towels and core them, cutting them in halves or quarters. If your apples are quite large, cut in quarters. Because my apples were hand-picked they had a few had bruises, but in a recipe like this that doesn't matter too much. Don't bother peeling them: this adds to the nutrition factor of this recipe (leaving the peels on adds great fiber and saves you a ton of time). Place the apples in the pot of your crock-pot or slow cooker and turn the heat to high. Put the lid on and let the apples cook for about 4 hours, giving it a good stir approximately every hour. Transfer the apple mixture to your blender (you may have to do this in two batches to avoid spraying piping hot apples all over your kitchen...not that I would know anything about that...) and blend on high speed until the mixture is creamy and perfectly smooth. Make sure you add every last bit to the blender. You'll need the crock-pot again in a minute and it needs to be nice and clean. Add the pureed mixture back into the crock-pot and stir in the cinnamon. Let it cook on high for another hour or so to let it thicken, stirring once or twice during that time. Let the mixture cool slightly at room temperature before adding it to jars or containers, and then store it in the fridge for up to 4 weeks, or in the freezer for even longer! The yield for this recipe will be slightly different with every batch (simply because of the different varieties of apples you use or the exact cooking temperature of your crock-pot) but a typical yield for my 5-quart crock-pot is about 4-5 cups. And because all it contains is apples and cinnamon, it's a super healthy 0 Weight Watchers PointsPlus treat that you're definitely going to want to try!! oh WOW, I want to make this immediately! yum! I like how you left the apple skins on! More nutrition and less prep time! Please could you use other fruits at all ? Could you tell me the instructions for using pumpkin? I would add one to two cups of pumpkin to the existing recipe as it is. You might find you need to add a little sugar to taste at the end, but you might not, depending on the sweetness of your apples. Loved this recipe! I just made some apple butter…yum. Can you can this in a water bath to make it last longer? I think you probably could. I have never done it but I'm sure if you use the proper canning process it would work well! How well does this freeze? I would like to make this for Christmas gifts, but I don't want to wait til the last minute. Do you use fresh pumpkin or canned if you want to add it? Can you use canned pumpkin or does it gave to be fresh in this if you want to add it in? I just want to make enough for two people to eat for a little while, is it ok to only use a few apple and not fill the crockpot? I only want to make this for about 2 people to eat for a little while. Can I use a smaller number of apples and not fill the crockpot? It keeps for about a week or two, but it never lasts that long in my fridge anyway (because we eat it all!!)! I use the microwave oven to cook and thicken. Have been doing this foe 4 years with apples and ,crabapples, also works with rhubarb. You could cook on your stove top until apples are cooked then pure in blender or food processor then return to a pot cook on med low simmet until thicken.. I suppose you could make it on the stove, but that would require a lot more work for you (stirring regularly so the bottom doesn't burn, etc.). This recipe sounds so easy and yummy! When you put the Apple mixture back in for last hour, do you put the lid to crock pot back on? Can't wait to try this recipe! Thanks! Yes, you definitely need the lid on for the last hour! This could not be easier!I was skeptical about leaving the peels on but I used my immersion blender and they all but disappeared. I used a combination of Golden Delicious, Honeycrisp and Green apples. I plan to make another batch next weekend to give away as Christmas gifts. Thank you Chrissie! You're SO welcome! Glad you enjoyed it! 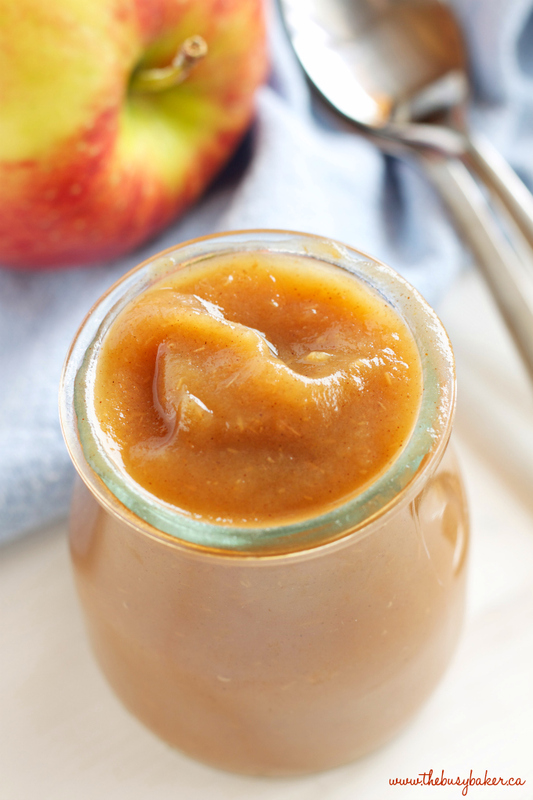 Can you then can the apple butter in a pot of water and seal the lid onto the jar so it will keep longer? Just wondering. Thank you so much. I just tried it and it's amazing. I have a friend who just started a new life healthy style and loves apple butter. This is going to be the perfect gift. Thank you again so much for sharing. One question, can you add a splash of lemon juice to help prolong it's refrigeration time? I am making this now! I can’t wait to try it! Has anyone tried canning this yet? Love the recipe. We are big apple butter fans. Just wondering if using a stick blender would work instead of blender? Absolutely! I just don’t happen to have one at the moment 🙂 Just be sure you don’t scratch the inside of your slow cooker! My crock pot is larger than 5 quarts. Can you tell me about how many apples. I’m sorry, without knowing the exact size it’s impossible for me to say – but just fill your Crock Pot as much as you can! Where did you find your jars? They are just a pretty as the contents and would be great for gift giving. Thanks! I have done this with applesauce and cinnamon also. This sounds wonderful. I do not like cinnamon in anything. I prefer the real flavor in every fruit recipe that I make. I will try this when we go to the Apple Barn in North Georgia in a couple of weeks. Feel free to add whatever flavouring you’d like, or none at all! I hope you enjoy! So glad you liked the recipe!! Can you do this with peaches? If so, leave the peel on? Or do I peel? Would you know where I can purchase those cute little jars you have pictured with the apple butter in it? Did it have a lid? I usually use Spartans, but any kind of apple works! This is absolutely delicious. Just made it today. Unbelievably easy. I will only use this recipe. Thank you. So glad you loved this recipe as much as we do! Just took this out of the crock pot! Sooooooooo good! Thank you for sharing. I used four different types of apples, wonderful flavor. Wouldn’t this work better with an immersion blender? Spooning it into a traditional blender seems silly and time consuming, not to mention dangerous, because the apples are so hot. Feel free to use an immersion blender if you wish 🙂 I prefer a traditional blender because I feel it creates a smooth, more silky texture, but an immersion blender will also work pretty well! 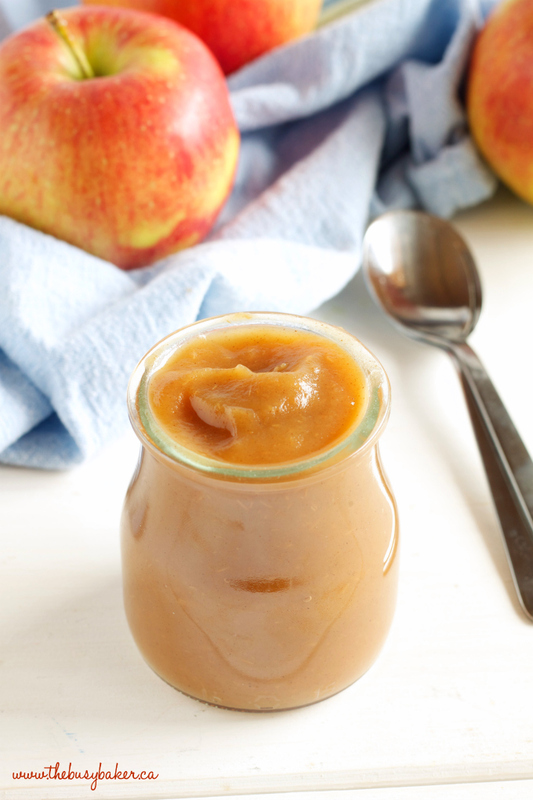 I just finished making this recipe and it is still quite watery, more like an apple sauce consistency. What could I do to thicken it? Hi Kim, try simmering it longer (for 1-2 more hours) uncovered. This will help the liquid evaporate. Also, as it cools it thickens, so don’t worry if the consistency is just a little bit too watery. It will thicken up even more as it cools. Hope this helps! I hope you enjoy it! I will add Instant Pot directions as soon as I get my hands on an Instant Pot!! They’re sold out all over Europe (where I live)! How well does this freeze? It freezes beautifully in freezer safe containers! I freeze mine all the time. I love this recipe. Thanks Crissy. I have made gallons of it now, and my freezer is full! I use it in many things. My home made baked beans, on my porridge oats for breakfast, in smoothies. It is incredibly versatile. I have tried one variation on it that works really well. I add pitted dates (I check them VERY carefully for remnants of pits and the occasional missed pit). 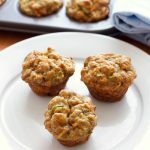 I add them in the last hour before I use the blender (I use a stick blender), and they blend beautifully with the apple. Just adds another taste possibility. It freezes just as well as your original.